Steve Kinniburgh wants Corby Town to continue to do things their way in their bid for promotion this season. The Steelmen claimed an impressive 2-1 success at fellow high-flyers Berkhamsted last weekend as they fought back from a goal down to win thanks to two goals from Joel Carta. 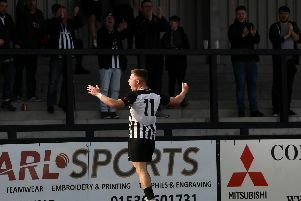 The win saw Corby move level on points with second-placed Bromsgrove Sporting while both clubs remain five behind leaders Peterborough Sports in the Evo-Stik League South Division One Central. Last Saturday’s game only went ahead after a morning pitch inspection. But, despite a heavy pitch, Kinniburgh was pleased with his team’s performance and he insists their approach won’t change even though some surfaces are beginning to deteriorate as the winter weather sets in. “But I am a firm believer that if you do the right things and stick your philosophy then you will get your chances in matches. “Regardless of the conditions, we will try to stick to what we feel we do best and that is moving the ball around the pitch rather than putting it straight into areas and look for set-pieces. “We want to keeping doing it our way and do it by playing good football. Corby have bounced back from a couple of defeats with two wins in a row. And Kinniburgh believes he has seen a “change” in his squad’s mentality over the past three weeks. This weekend’s clash takes on extra significance with Bromsgrove entertaining Peterborough Sports in a big top-of-the-table encounter. And Kinniburgh added: “We have got back on track with a couple of wins in a row and we need to keep it going. “I have spoken a lot about mentality and I have seen a big change on that side of things over the last three weeks or so. “There has been a thought process and a different approach to the games from the squad and that’s extremely encouraging. “If we can go into every game with the right mentality then it will give us that extra opportunity to get over the line.